The other factors responsible for the growth in the market include higher allocations for healthcare infrastructure, rising economic stability, and increasing participation of major market players in in developing economies such as Latin America and the Middle East and Africa. On account of the aforementioned growth drivers, a report by Transparency Market Research projects the global Nanoemulsion market to rise at a healthy 9.2% CAGR from 2017 and 2025 to become worth US$14.91 bn by 2025 from US$6.78 bn in 2016. The global market for Nanoemulsion can be segmented based on different parameters. Depending upon the type of drugs, for example, it can be segmented into steroids, anesthetics, NSAIDs, antiretroviral, antimicrobials, vasodilators, immunosuppressant, etc. Of them, the segment of NSAIDs is slated to outpace all others vis-à-vis growth rate by registering a CAGR of 10.1% from 2017 to 2025. This is because of the rising use Nanoemulsion formulation in topical and other drug administration routes for more effective drug delivery allowing for rapid penetration. In terms of market share, however, the segment of immunosuppressant lead the way with 21.3% share in the global Nanoemulsion market in 2016. From a geographical perspective, North America at present dominates the global Nanoemulsion market. By expanding at a CAGR of 9.3%, the region is expected to pull in a revenue of US$5.96 bn in 2025. The dominant position of the region is a result of a well-established pharmaceutical and biotechnology industry, thrust on research activities for product development, and increasing prevalence of chronic disorders. Europe trails North America vis-à-vis market share. The revenue in the region is predicted to grow to US$5.217 by 2025. Nanoemulsion is the procedure of suspension of minimicrons of globules of one fluid to different fluids that are immiscible to each other. Nanoemulsions are oil-in-water emulsions with mean size extending from 50 to 1000 nm. Normal size of a bead is in the vicinity of 100 and 500 nm. Nanoemulsions are produced using surfactants endorsed for human utilization and sustenance substances that are perceived as protected by the U.S. FDA. Nanoemulsion can be readied utilizing a few strategies, for example, smaller scale fluidization, high weight homogenization and sonication. Nanoemulsion is likewise called miniemulsion, ultrafine emulsion, and submicron emulsion. Nanoemulsion can break up vast amounts of hydrophobics, this alongside its high similarity and capacity to shield drugs from hydrolysis and enzymatic debasement make them perfect vehicles for transport. Serving to significantly fuel the worldwide market for nanoemulsion is the quick innovative advance in the pharmaceutical and biotechnology industry, rising cases of endless maladies, expanding mindfulness about their medications, developing interest for more target particular medication conveyance frameworks, and strong approaches of governments. Rise of mechanically progressed new items is likewise positively affecting the worldwide Nanoemulsion market. Alternate variables in charge of the development the market incorporate expanding human services framework, expanding monetary strength, expanding cooperation of significant market players in creating economies, for example, Latin America and the Middle East and Africa. Expanding interest for more effective medication conveyance frameworks and expanding innovative work is required to drive the market amid the estimate time frame. As the nanoemulsions don't experience flocculation or sedimentation they are perfect for use in infant mind wipes or make-up evacuation applications. This is another development driver in the market. As nanoemulsions are non-lethal and non-aggravation they are broadly utilized as a part of healthy skin beautifying agents. Nonetheless, the cost of nanoemulsions readiness can turn out to be a hindrance to the nanoemulsions market. From a geographical point of view, North America currently commands the worldwide nanoemulsion market. By extending at a robust CAGR of 9.3%, the region is relied upon to pull in a revenue of US$ 5.96 bn in year 2025. The prevailing position of the area is a consequence of a settled pharmaceutical and biotechnology industry, based on research procedures for item improvement, and expanding predominance of incessant issue. Europe trails North America versus market share. While Europe and North America are predominant in the nanoemulsion market as far as size is concerned, Asia Pacific will probably run the show with regards to development pace by timing the greatest CAGR of 9.4% within the forecast period from 2017 to 2025. The changing socioeconomics and the expanding salaries of individuals in the region, especially in the thickly populated nations of India and China, are serving to drive development in the area. Latin America is another locale that is anticipated to develop as a beneficial because of government’ to advance pharmaceutical and social insurance enterprises and the expanding human services consumption. The Middle East and Africa nanoemulsion market, then again, is required to develop due to the expanding number of items and activities by governments to advance innovative work. 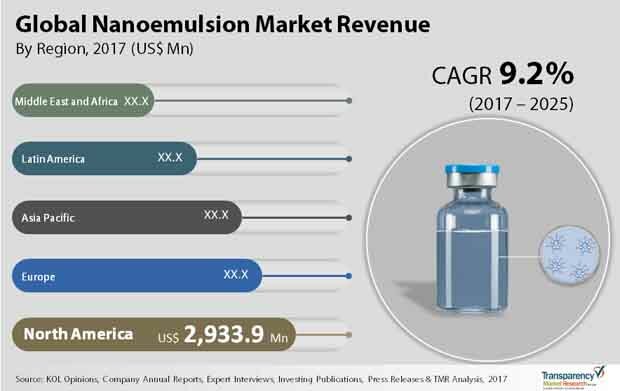 Allergan plc, AstraZeneca Inc., Novartis AG, B. Braun Melsungen AG, Mitsubishi Tanabe Pharma Corporation, AbbVie Inc., Fresenius Kabi AG, Kaken Pharmaceutical Co., Ltd., and Sanofi, are some of the major players in the globala nanoemulsion market.